My best laid plans of blogging while in Houston never materialized. As a backup, I planned on writing when I got back to Ohio which was Sunday. There was a lot of work to catch up on, mostly writing lectures and grading projects and papers. So here it is Saturday, with plenty to do, no idea where to start and a blog I haven’t attended to. Without re-hashing every meeting, with all of the good and the bad. I want to condense it all into a sense of direction. I got to re-visit Dr. Frangst and by re-visit I mean reacquaint. I had to discuss work I really haven’t talked about in a few years and I was forced to think about where the project ended. Getting reacquainted with a project means thinking about what worked and didn’t work. It also means after a few years of water under the bridge, finding a way to reconnect with the project. 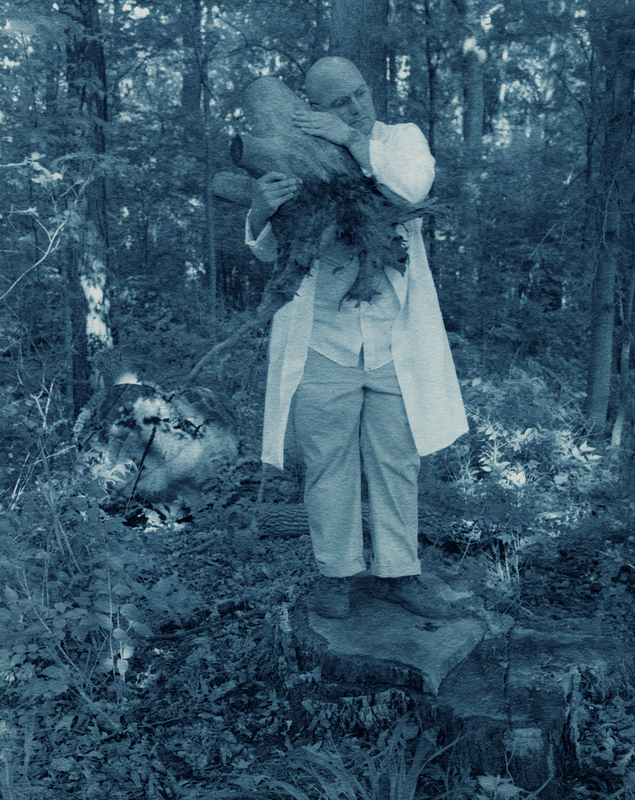 The last image I did was of Dr. Frangst hold a “baby” tree trunk rescued from my neighborhood. It really was a homage to the Jan Svankmajer film “Little Otik” in which a childless couple raises a ravenous tree stump as their offspring. I don’t think it was a misdirection but rather a mis-edit for the project. 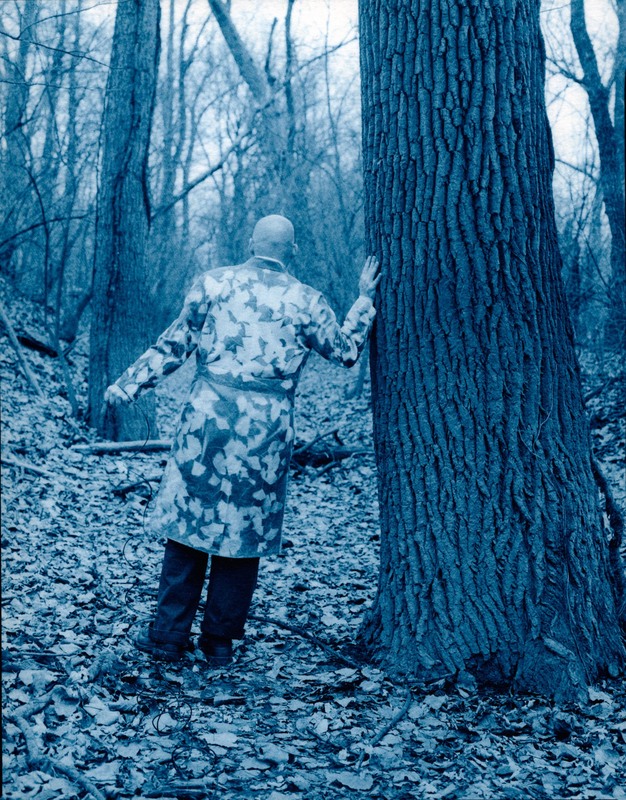 The last really successful image is Dr. Frangst in the Gingko Photogram coat. This is where I think I can re-enter the project. Creating more of these photogram leaf coats and wearing them in the Ohio landscape. 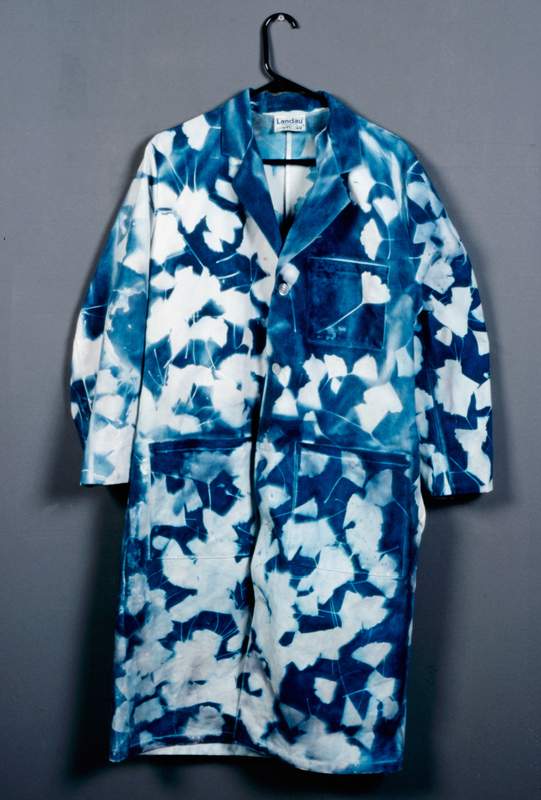 Additionally, the lab coats themselves will become photographic objects that I will display. This means teaching myself how to sew (maybe having Bridgette give me some lessons and getting her sewing machine repaired) because I am going to be using a sewing pattern to create pieces of coats which will be exposed and processed in the cyanotype process. Next up yellow and purple together in the anthotype process. Today I woke up to a foggy Houston morning. 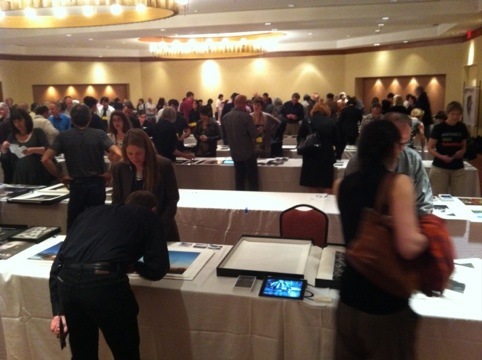 This is the last day for reviews at FotoFest 2012 session II. So far it has been worth the trip to Texas and I’ll detail this in a future blog post. notes following reviews which will help with the all important follow-up letters and thank you notes. Last night was the open portfolio night which is the connection to the image below. We each had four feet of table space. It’s a bit awkward writing a blog post on the light rail so this is a good enough stopping point. At the start, let just get this out of the way: I do things the hard way. I am basically carrying a chunk of what I consider my studio. For Houston, I brought 5 large anthotypes, rolled up in a tall plastic tube as well as two smaller ones. Next is the hard case, a too large to carry-on suitcase which has my clothes, two larger portfolio boxes and toiletries. Addtionally I have my messenger bag with lap top, an Agfa 11×14 box with some extra prints to exchange or sell, chargers for the computer and cell phone, a hard drive, etc. etc. etc. Here’s the narrative of my travels today: lug this stuff to the check in counter at the Columbus airport after an hour drive at four in the morning. Did I mention that my flight departs from a city different from my final return trip city of Dayton? )Retrieve the luggage after a turbulent re-route of my Houston flight (an extra two hours in the air). Forget the large tube of anthotypes while retrieving the hard suitcase from a locked cage near the baggage carrousel ( I evidently took my time going wee, eating a Tampico burrito form Papasitas). Not realizing I had forgotten my tube until I was handing my luggage to the Super Shuttle driver. Running back to locate the tube, finding it and running back to the shuttle. Checking in at the Meeting Place office. Did I mention I liked to do things the hard way. Instead of going directly to my off-site hotel, I decided to lug all of the luggage through the Double Tree (three bags full, sir) and then track down my hotel. Going out Dallas street to Main (maybe five city blocks) to pick up the light rail. Buying a ticket on the correct side of the tracks to go to my hotel. Thinking it was the wrong direction and walking up a block to board the light rail going in the wrong direction. Taking it in the wrong direction for one stop. Exiting and re-boarding the correct direction. Taking the train down towards Reliant Park and the Medical Center while talking to a suspiciously friendly dude who was telling me he inherited a Houston Pedicab company. He technically didn’t call it a pedicab. He described it as a three wheeled bike that has two seats in the back and was a business. Exiting the train at the correct stop but walking the wrong direction (away from the hotel) and then back again. I should have checked in first. 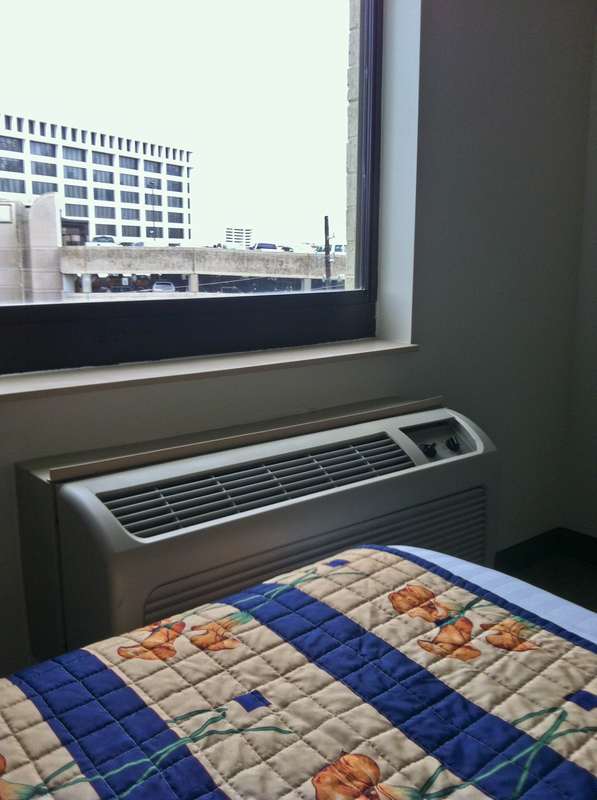 BTW, I think this room is half the size of our house and it has two flat screen TV’s in it. Thank you Margie and Ray! I think I will watch cable and avoid tomorrow’s portfolio reviews. After all, it’s always humid in Houston for a gent carrying too much of his studio on foot. The last few weeks have been both chaotic and structured in preparation for Houston. Good printing days and bad printing days. Bad printing days followed by no printing days. I really shouldn’t be mussing with gold and palladium toners with the Van Dyke Brown prints this close to FotoFest. Needless to say, all the lack of blogging will be followed by an avalanche of correspondence once step onto Texas soil. 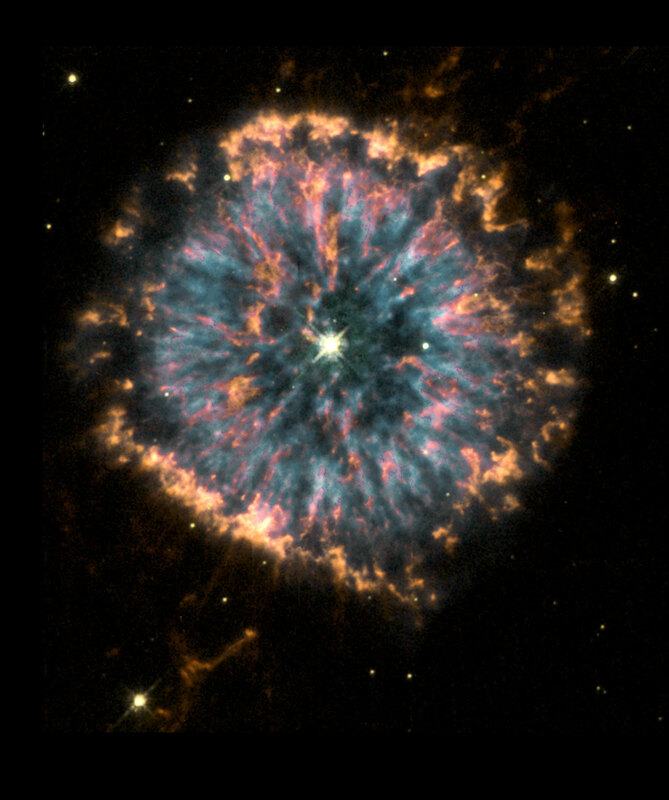 In between now and then, how about a little synchronicity between my new favorite muse, apples and perhaps my even newer, new favorite muse, images of planetary nebulae from the Hubble telescope. I came across this, strangely enough, from a recent Los Angeles Times column about their decision to scrap the star rating system for restaurant reviews. 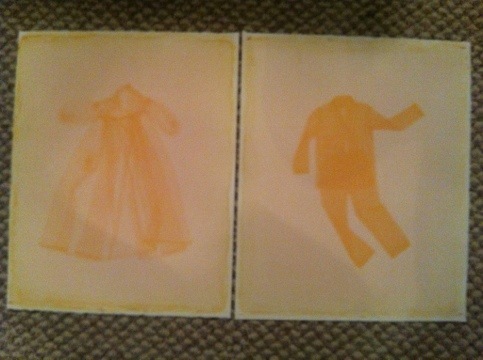 Just a quick snap of the new saffron anthotypes, “Mommy” & “Daddy”. Better pictures on Monday. Article. That word seems strange to me this morning. Am I spelling that correctly? There is an article in the Dayton City Paper regarding the nature of the jurying process that most artists at one point or another must go through.Here’s the link, http://www.daytoncitypaper.com/the-jury-process/?utm_source=rss&utm_medium=rss&utm_campaign=the-jury-process. The article gives some insight into the challenges faced by one juror, Mary Gaynier, who selected the works shown in the current Works on Paper exhibit at the Rosewood Art Center gallery. Also interviewed for the piece is Amy Anderson, the gallery director, who discusses the high quality of work that didn’t make it through the jurying process. She actually documented some of the rejects including a wonderful piece by David Kenworthy and posted them on the Rosewood Gallery site on Facebook. This link should get you there or try http://www.facebook.com/photo.php?fbid=10150659929941802&set=pu.92709556801&type=1&theater.